Ever since the VMware Photon Technical Preview was made available, I have wanted to install Apache Mesos on a node. The Photon OS is a very minimal Linux installation and so my initial attempts to work through the process led me down the old-fashioned rabbit hole of manually compiling packages. It was very reminiscent of the later 1990’s and using Debian installed via floppy disk. I finally found the time to work my way down and back out of the rabbit hole and have been able to successfully get Mesos to install and run on Photon! This is a good first step towards building a Photon template to be used inside Big Data Extensions for deploying Cloud Native Apps with Mesos|Marathon|Chronos or Kubernetes. The lab environment I used is running vSphere 5.5 and consists of a small set of nested ESXi hypervisors. I am not going to cover install Photon on a VM, but just be sure you have one that was installed with the full OS — not the minimal installation. After the Photon VM is configured to communicate with the Internet, you can follow these instructions to get Apache Mesos installed. The end result of the guide will be a working Mesos node running on Photon that can launch Docker containers. Be sure to follow it in the order listed as the ordering of the packages is important. Also have a Photon VM with at least 3GB of Memory allocated to it for the compile processes. 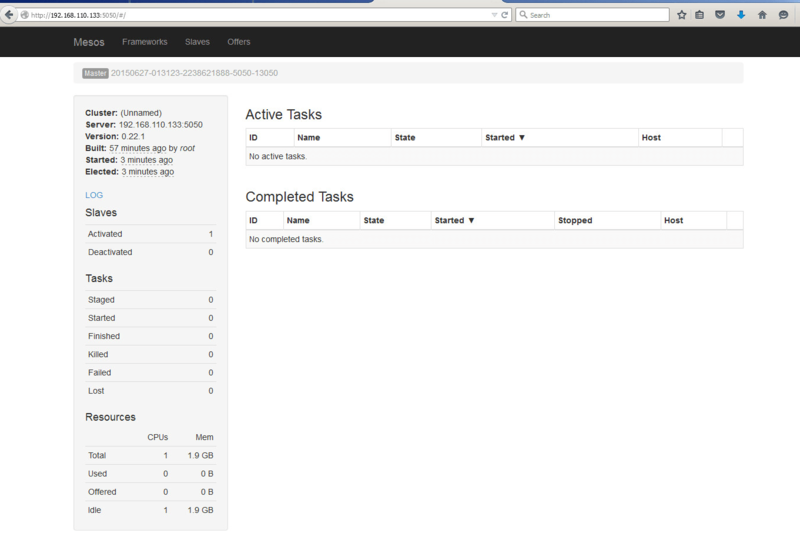 After Apache Mesos is installed, you can start both the master and slave processes on the node to run a quick test. Afterwards, open a web browser and point to to http://127.0.0.1:5050 and you will see the Apache Mesos interface. The next step will be to deploy multiple Photon nodes and configure them to be a part of a single cluster. I will likely orchestrate all of this through Chef next and incorporate it into the Big Data Extensions framework. There is always more to do, but I am glad to have gotten this working and sharing it with everyone. Reach out to me on Twitter if you have questions.